The following are anecdotes which I remember. I am sure that I have forgotten or confused some of the details and will appreciate any builds and/or corrections from any readers. I will from time -to-time sit down and record new remembrances. I confess that as I sit here I feel I am somewhat presumptuous to believe that anyone will be interested in the tales I weave here. I do hope my effort will encourage others to take the time to author their own Canal Zone remembrances which I volunteer to publish here on the web. Send them to me via e-mail and I will provide the forum for their dissemination on the World Wide Web. The Darien and the "Old Ones"
I will also add to the end of this journal chapters which narrate my life after leaving the Canal Zone. After coming back to the States I went to American University and then on to Temple School of Data Processing. In the '60s I became a programmer and from there I progressed to the top of the profession. During my climb I was the first Director of MIS for MCI Telecommunications in 1974, Manager of Professional Services for Litton Computer Services for 8 years, Consultant for Booz Allen Hamilton, and my last managerial position, Technical Director for CAP Gemini/ Ernst & Young for 10 years. I then went back to the technical realm and now work as a Senior Developer for FannieMae, with 2 Trillion dollars in mortgages in our portfolios and s ystems. I live on the Washington, DC area; 12 miles west in Fairfax, Virginia. In 1974 I married a great little lady from the Pittsburgh area; a 5'2" tall goddess of Greek ancestry. We have been married now for 26 event filled years and have a fine 28 year-old son who has worked in the Senate and graduates Law School in 2003. I feel I have been truly blessed and have reaped much better than I sowed. I was born in Santo Thomas Hospital in Panama City, Republic of Panama in 1943. I was delivered by Dr Ramon and was born in Santo Thomas because my mother preferred Dr Ramon and he did not practice at Gorgas, in Ancon. My grandfather was Howard Lindon Clarke, who my contemporaries will remember as the greens keeper at Summit Hills Golf Course. My dad is Leslie (Biff) Bastian Clarke and my mom is Lillian Bishop Clarke. My uncle on my dad's side is Howard Linden Clarke. On my mom's side I have and uncle as well, Archdale (Dale) Bishop, after whom I am named. The final aunt was Margaret (Pug) Bishop Brandy who died several years ago. Grandpa was the first of my line to go to the Canal Zone during the construction days. My dad was born in the states, Newport News, Virginia, in order to protect him and my grandma from the diseases then prevalent in the Zone. Dad returned at an early age and attended elementary and high school in the Zone. In 1933 dad took an apprenticeship as a shipwright and cabinetmaker. My mom was on vacation in the Canal Zone and met my dad and they were married. The rest, as they say, is history. When I was born my parents lived in Ancon. We lived on Tavernilla Street, and on Bougainvillea Street, off Amador Road. (Balboa Map BIG| *HUGE*) Slow to load -- very large file. We moved to Margarita when my dad went to work in the mechanical division there. We lived first for a short time near the Clubhouse on Second Street, number 8033, then we lived on Sixth Street and finally moved to Snob Hill just before they extended it down the hill. I lived in the last house on the left. 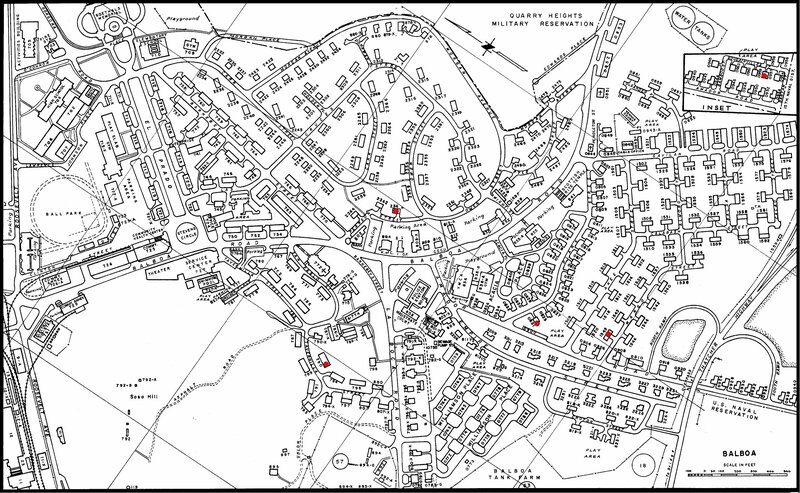 See the marked houses. (Margarita Map BIG!) (Huge!) Slow to load -- very large file. I remember taking a dead 8 foot long boa constrictor the grass cutters had killed to show-and-tell at school. I got the day off. Names I remember there are Sharon Cooper, "my" first girlfriend (she liked someone else). Also, my cousins, Howard and Tita Clarke, Maxie Sanders, Charlie Chase, who beat me out as catcher on the Little Mottas, Jim and Bill Wills, Dockery, Gary Maloy. We then moved to Detroit, Michigan for about a year. That was my 5th grade year. My best friend in Redford Township, off West Grand River, was Roger Brown. When we returned to the Zone my dad worked for the navy on Rodman Naval Station and we lived there for a short period. While there, dad and I built an 18 foot day cruiser with two 35 horsepower outboards. We built it in the hobby shop and coated the hull with fiberglass. Everything tasted of chemicals form the catalyst for the fiberglass we kept in the refrigerator. 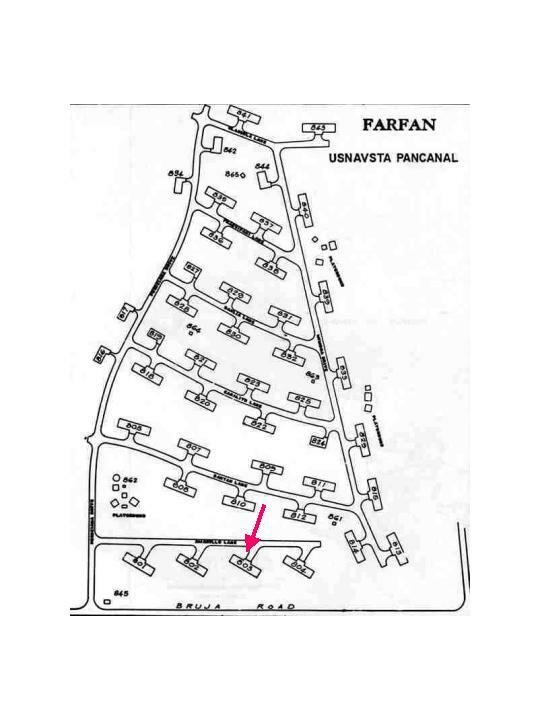 When quarters became available, we moved to Radio Farfan, just inside the gate at Fort Kobbe on the left as you enter. I was the bouncer at the Fort Kobbe teen club. Names from this period include Larry Self, Frank Todd, Johnny and Bobby Fortune, Mouse Maxwell, Tom Mallia. I met my best friend Robert (Pio) U. Schultz around this time. From there my dad went back to work for the Pan-Canal Company in the Contract and Inspection Division. 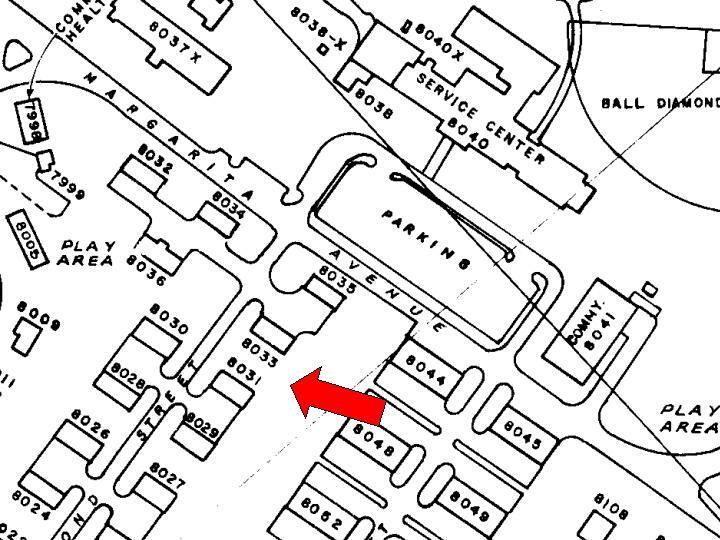 We moved to Mango Street, just off Amador Road. Jackie Ashton lived 2 houses down. I had a screened in room of my own dad built for me under the house. This is about the time I succumbed to the Sosa Hill tradition of beating the "bomberos" to the hill. Shortly thereafter, I joined the US Air Force without finishing high school. I injured my knees badly in my first year at my permanent base, Lowery, in Denver, Colorado, and was discharged. I returned to the Zone to finish highschool and graduated from Balboa High School in 1963. My parents seperated shortly after my return to the Zone with my sister Nancy remaining with my mother, and me going to live with my father on Plank Street in Balboa. In 1964, I took pictures of the 1964 Flag Riots. I was withdrawn failing from my classes at the CZ College which I had neglected during the disturbance. The head of the College at that time was Dean Lattimer. I applied for an apprenticeship, took the tests, got a grade in the 90s, and was beaten by a Panamanian with a 75% due to quotas; I was told that third-generation Canal Zonians couldn't get apprenticeships anyway. My mom had gone to Washington, DC, to work in the Panama Canal Company office there. She invited me to come to live with her and to go to finish college. The early 60's were a turbulent time in the US and universities were avoiding radicals like the plague. I cannot prove it, but I believe that the universities were informed that I had taken pictures of the 1964 Flag riots and that I had flaunted the authorities by selling pictures to the media. Being unable to enter a college in the Washington area, I took a job as a gas station attendant at Rand American Station on Quaker Lane in Alexandria, Virginia. I was living with my Mom and sister Nancy on Preston Lane, some 6 blocks from the station. I had sold all my cars when I left the Zone. I had owned a green 1955 Turner sports car which I had driven in the 1st Panama open, a 1955 Mercury convertible, a 1953 Pontiac convertible with no top and holes drilled in the floor to let the water out, and a 1949 Ford with the back cut out. We used the Ford to go to parties, filling the void left by cutting off the back and removing the seat with ice and kegs of beer. Richard and Fred Levee and I left a party at Contractors Hill toward Rodman Naval Station for more beer. As we passed the electric plant on the right hand side at about 90 miles per hour I realized we were not going to be able to make the right turn at (was it?) the Foreign Legion Club at that speed. Rather than turn the car over with Fred standing up in the back, I took out the sign posts and slammed across the boulders toward the cavern that was the Third Locks, an 80 foot drop. The Clarke luck held up. We stopped 10-15 feet from the edge and all I lost was an oil pan. We sat for a while finishing the keg that had not flown out into the locks, tossing dry ice into the water and admiring the smoke it made as it wafted up through the headlights. When the beer ran out we walked to Cocoli and called my houseboy Victor to come and get us and tow us home to Plank Street in Balboa. I got enough money from the sale to buy a champagne colored 1963 Chevy Corvair Spider. I was working at the station and spending weekends either racing the Spider at Acquasco Speedway in Maryland or going to the beach at Ocean City, Maryland. In Ocean City, nights I hung out at the Purple Moose Saloon and days worked at the Twirl-a-paint booth on the boardwalk. I was dating 2 girls in Ocean City. One worked at the Pancake House and fed me free when I came in after the bars closed at 2 AM. The other was a barmaid at the Moose and fed me free beer and bar nuts. They booth worked nights so I was free to "chat up" girls from there on vacation as long as I avoided places I was well known. The two girls I was dating knew of each other and competed for my attention. I alternated living with them on my weekends there. At the same time, back in Washington, DC, I was dating a girl who worked in "Mom's Crab House" near Capitol Cadillac. My mother felt that I was not advancing my future, that I was a "ner-do-well", and told me I had to go to school or move out. Go figure! She went so far as to pay for the school I chose, Temple School of data processing. I decide by looking in the classified in the Washington Post and analyzing which profession paid the most for the least apparent effort. At that time electronic data processing won, hands-down. I took a one-month course in which I learned to operate electronic card sorters, operate and wire card collators, card interpreters. I learned to operate the IBM 026 keypunch and 056 keyverifier. I also learned to program the IBM 1401/1410 General Purpose computers in the autocoder and COBOL. I went to school 12 hours per day and took every class they had. I loved it and matriculated with a 97% "A" average. I went out to look for a job and found that, without experience no one got a job and without a job you could not get experience; "Catch 22". While at Temple School, I met Kennly Drummond, a great lady, who ran the keypunch group. I told her I wanted to take her to Ocean City for the weekend but the Spider needed tires. She bought me 4 Michelin X tires and paid for the hotel we stayed in. Well, she had a good job, and it was better than spending my meager money and buying my own! Kennly was as close to the perfect girl as I had found since leaving the Zone. I dated her for a while and I lived with her for a while, until she started to tell me why she was fighting wanting to get married. I saved her the conflict and immediately moved back in with mother, though I continued to over-night at her place from time to time. I alternated between my abortive job search and bouts of depression where I slept all day. My mom asked me to take her shopping for clothes. While dutifully waiting for her to try on dresses I tried to pick up one of the two sales girls. "Danger, danger, Will Robinson!" One night after dating her for a couple of months, when I arrived to pick her up for a date, I was met at the door by her mother who was brandishing her fathers police service revolver. She forced me into the house where her father talked the mother into letting him have the gun and sat us all down to talk. Let me describe the parents. Stella Mae was close to six foot tall, well overweight, dressed in a pink bathrobe, her orange dyed hair was in hair curlers, and on her feet were pink house slippers with matching pom-poms on the toes. In one hand was a can of beer, in the other between yellowed fingers hung a smoking cigarette. Oh did I note she spoke with a nose-twang Texas accent? She worked for the NRA and hated me with a passion. It was obvious to whom the whole family cow-towed. Her father was a smallish man, five-eight or nine, with a military haircut that fit his profession as a former Capitol Police officer and the current Washington, DC, "Hack" inspector. He sat there holding the pistol non-threateningly like a beanbag that he passed back-and-forth, hand to hand, as he spoke. The gist was "marry her or stay away from her". At that moment Leslie, my blonde, appeared with her long hair soaked with tears, her eyes swollen from crying, clutching a 50s brown suitcase in two hands, and obviously expecting me to choose "marry her". Unable to decide, I told her, "let's go", and we left. These anecdotes are ones my mother and father told me concerning my early childhood.
. Obviously, I don't remember anything about this time period. I have been told that while learning to talk I saw airplanes landing at Albrook. My mother told me "Air Plane" to which I parroted "Air Binny". She corrected me, "Air Plane" and I repeated "Air Binny". Thus it went all day, a battle of wills. The next day, however, when I saw a plane landing, I pointed and said proudly, "Air Plane". My Mom recounts that she always impressed upon me that keeping my clothes clean was critical. I proved to her that I had learned the lesson in a way that embarrassed her a bit. Mom got me all dressed up to go to a local birthday party and then went up to get dressed herself. She put me into a fenced off portion of the carport under the house to play with my toys and wait for her to get ready. Her last words before going upstairs were, "don't dare get your good clothes dirty!" On coming down, she found I had complied... My clothes were neatly piled on a chair, the chair I had used to climb over the fence. She found me at the birthday party.. Even at that early age I was the hit of the party. I was told that on a trip to Santa Clara with my Dad's good friend Bob Adams his son and I shared a laundry tub down on the beach as a pool. Now, Bobbie Adams was bigger than I was and it was his Dad's wash tub so Bobbie was monopolizing "our" pool. I tried unsuccessfully to join Bobbie in the tub. To the amusement of the adults, I then tried to physically remove him, to no avail. My "can do" spirit then showed itself, even at that early age. I enlisted the aid of a captured large toe-biter crab which got Bobbie out of the tub on the run. If I couldn't enjoy it, well then, no one would. - As I recall the house, (Balboa Map) it was a concrete four-family with stairs running on the outside up the back to the back doors. I was very young when we lived there. I recall (perhaps was told) about several events which occurred while we lived there. I recall vividly being forced by my parents to put on diapers because I had an accident in my pants. They did this to shame me into being more careful. I remember waiting as close to the front door as possible until I was let back in (probably a very short time which seemed interminable). Caught experimenting with matches and a cigarette, I was "allowed" to try one. One was lit for me and I was instructed to take a deep breath.... I still cannot smoke and am nauseated by the smell of cigarettes. I had frequent boils which the maid told me I experienced because Tavernilla Street was a place of the dead. I later found testimonials that the place had been used by the French to bury Chinese who had died of yellow fever. The one event that affected me most was the accident. My Mother was making coffee in an electric percolator. I was playing on the kitchen chair and jumped on the percolator cord, dumping scalding hot coffee and coffee grounds all over me. I had third degree burns on 1/3 of my body. I was taken to the hospital and put in medicated Vaseline inside a body-shell cast (a treatment learned treating burned WW2 pilots) I was also given sulfa as an antibiotic. That night, I got a reaction which the doctors took for measles and for which they quarantined me in the quarantine ward. The old people coughing and wheezing scared me and I climbed out of my crib and headed home. Caught, I was netted into my crib where my mother found me the next morning. She found my crib in the children's ward empty and, after recovering from the heart palpitations precipitated by believing me to have died during the night, was directed to the quarantine ward. The netting caused me to begin biting my fingernails; a habit I have to this day. - Here I have visual memories. I had a dog who we had named Yippie in honor of his nightly incessant vocalizing for our attention. The neighbors were apparently bothered by his habit and poisoned him with what I later realized was cupric-sulfide. He died with blue all over his lips, the maid said he was poisoned, and I found a dish with meat scraps colored the same blue. My logic said the neighbors had poisoned him, so, before they returned home, I dipped out every one of their hundreds of beautiful tropical fish and sent then to 'fishy' heaven. I took their dish, and Yippie and buried them behind the house. I told the maid what I had done and why and though I would not tell my Dad why she did and showed him the grave. The neighbor was going to sue until my Dad exchanged his dish for his written promise not to. The humane society penalty pertained to dogs, not fish. I remember an incinerator across the mud-flats which had a huge red brick chimney. One afternoon all the neighbors go together and sat on the bank of the bay and watched and waited for something. Suddenly, there was an explosion and the chimney came tumbling down, leaving a huge cloud of smoke. The back yard was fenced by a tall hedge of hibiscus containing every color found in Panama. We lived at 3 houses that I remember in Margarita. We lived right near the Clubhouse for a few months when we first went there. On Second street 8131 or 33 I think. (See Map) I was around 7 when we went there so stuff is hazy. I remember carrying grocery bags out to the cars for ladies and then buying small toys from a section right in the fromt of the commy with the change they gave us.The change if I remember correctly often was a stamp or 2 in a coupon book. My mom told me not to go there and do carry out because it made us look poor. I did it anyway and when I came home with a toy she assumed I had "lifted" it. She marched me over and stood me in front of the manager, a gruff sort as I recall, and demanded that I make a clean breast of it. I told her I didn't want to but she kept insisting. By now there was quite a crowd of her friends bingo buddies, canasta club friends, etc crowding around to hear me "fess up". Mom verbally prodded even resorting to the dreaded "Wait 'til your father gets home!" which was the proverbial straw. I blurted out that I had carried Mrs Moomaw's (how did I remember that name? Lord help me...) bags and had bought the tiny toy with my ill gotten gain and then I worked the crowd -- I pleaded with everyone, trying with a child's desperation to make them believe, "WE WEREN'T REALLY POOR!" Ever seen wind drop out of a sail? I knew we were clearly done there as mom turned and slunk away dragging me by the hand but with out a crystal ball I knew my pop and I would have a date later in our maid's room with Mr. Stick or the razor strap! We can sure come up with some doozies. I do agree if it is not for Profit and we can benifit from it as zonians then what is the fuss? Well enough said. I have a question. When was Margarita Hospital built? I was born there In 46 and wonder how many of us were born there? Just a curious question. Have a good evening. Dennis, Old Cristobal, New Cristobal, Margarita, France Field now here. Redbird wrote:Well well well! I see there is a new topic to mull over. I guess I missed all the fussing about. Eric, just what did Ms. Marti allegedly copyright that was yours? We do keep on feuding and fussing. Make nice, kids. Make nice. ---------------------------------------------------br> I remember playing in the hospital a lot when we lived on Cottage Place off of Sixth street. We moved to France Field in 59. Sure had a lot of fun there. The morgue was a neat place to hide and they had some big doors there too. We used to roller skate and ride bikes under the grade school they had near there. I think it was called North or Northside Elementary. I went there before they opened Margarita Elementary School. So so many good memories. Trick or treating was fun back then too. Dennis the Menace Old Cristobal, New Cristobal, Margarita, France Field now here. Gary Collins wrote:so, when was it torn down? I moved to 6th st in 1960 and it was no where to be found. In fact, there was another bldg there then, the credit union?? was there a credit union? I can't remember. If I remember right, they stopped using Margarita Hospital about 1950 or so but it was quite a few years later when they actually tore it down. After the hospital was abandoned it became a playground for all the Margarita kids even though the CZP did their best to keep us out. There was a nice ginup tree on the Snob Hill side of the hospital and on the school side next to the gulley was several bouganvillea bushes big enough for kids to use for forts. A 12 family nurses quarters sat on the slab at the end of Sable Place. After the hospital was abandoned it became regular bachelor quarters. Several CHS teachers lived there before it was finally torn down. Over the years the Woman's Club, the Credit Union and a Baptist Church were built on the site of the old hospital. Speaking of guards... We got a lot of DRs (delinquency reports) for our dads. Many were unwarranted so we replied with high jinx... One of the pranks we did pull was blocking the howitzer by the Chapel with a paper cup and the putting the remains of several roadkills in before a parade... Made the nicest oily red morning reveille mist over the reviewing troops and a slick sleeve out of the Arty Sgt. I heard that a few years before a dependent loaded a set of pool balls in the same cannon and filled the hanger roof at the end of the parade field with holes. The MP Sr Master Sgt swore to get us... Name of JJ I think... He chased us up to the Chapel and parked his MP Cycle at the circle to chase us... Corpulent as he was we stayed just out of reach while a band of kids hoisted his cycle up the pole and tied it there with the garrison flag cables... Winded he came back to find it 6 feet off the ground... Not thinking and forgetting that Harleys weigh more than he did he untied the cable... Did you know Harleys can catch fire when dropped from 6 feet? It made a horrible sound when it hit too... After that he pursued us relentlessly... We had to end it so we set up (funded) a rendezvous with one of the less moral maids. She met with him on the road to the beach while he was on duty in one of the MP pickup trucks. we took pictures into both the open doors of the truck during the tryst... He had a surprised look on he face and the maid was waving to us. We had no more problems fro JJ... Shortly thereafter Joe Van Orman, the provost Marshal's son joined our group and sealed our military "Paz y Salvo". Boy were we bad... I bet no one on Zonelink was this terrible! In 1956-57 in the Panama Canal Zone I was a boy of 13. 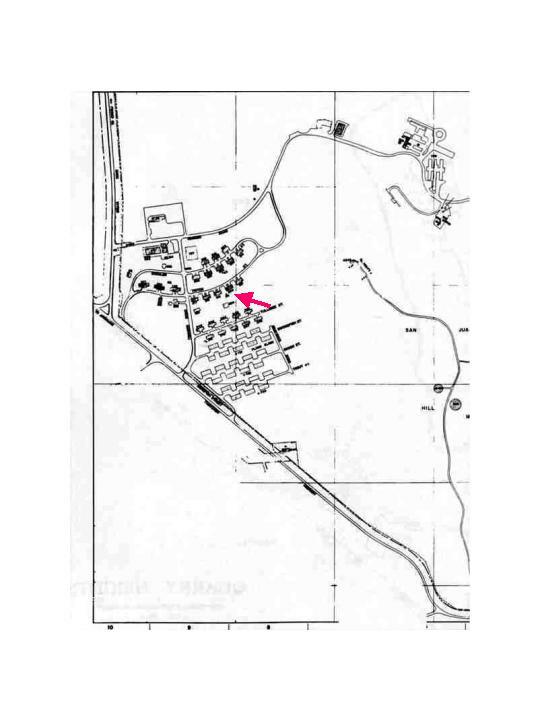 I was living with mom any sister) in Radio Farfan (see map) inside the gate of Fort Kobbe, CZ. That's on the Pacific side south of the canal itself. It is on the same side of the Isthmus but across the canal from Balboa and Panama City. This was a time before the Bridge of the Americas when we crossed the ditch by the Thatcher Ferry at Laboca or via the swinging bridge at Miraflores locks close to Cocoli and Fort Clayton. I recall waiting interminable periods going home on the school bus while the bridge swung open for ships to pass. I remember singing "16 Tons" - ....Sooommmm people say a man is made outta mud - a poor man's made outta muscle and blood..." Being the bouncer at the Kobbe Teen Club I boomed out the 5th and 7th verses in my newly acquired basso-fundo (recently hatched out of a 1st soprano egg) to help cement my position. Some drivers let us get off on the approach to the bridge while it was open to look down in the tidewater beside the canal. There were huge fish lazing in the mangrove roots when the tide was high. I dreamed of going there to fish but never figured how to get there without a boat. If the bus was way back near the Clayton turnoff we ran across the pedestrian walk to the Cocoli side and waited for the driver to pick us up. We used to give the "nice" bus drivers our lunches or at least the apples or grapes - I usually kept the peanut butter-n-jelly sandwiches the maid made me. Gayle Brannon was the name of my reason for going to the Teen club. She lived on the far side of the Chapel and was my jitter-bug partner to "Lollipop", "Blue Swede Shoes", "Jail House Rock", "Be Bop Be Lula She's My Baby", and my leaning post for "Smoke Gets in Your Eyes" and others. Always tried to get the slow dances in befoslow dances in before you got too sweaty. Learned my dance moves at Harrnet and Dunn like most everyone else. Frank Todd was my best friend - I loved Herpie, his 8 foot Boa. I had a thing for his sister but she never gave me a tumble. Ran with Bobbie and Johnnie Fortune, Frank and John Todd, Larry Self, Tom Mallia. I would take my Model 57 Remington pump 12 gauge and ride the bus (can you imagine doing this today) from Farfan to the stop nearest the back gate on the Veracruz road along the coast. Back gate was a euphemism as there was no one there. It was two posts with a rusty wire rope with a simple hook on it. Didn't even have a lock. They had a chain and a lock but the Panamanians kept stealing it so the army put the rusty wire up. Veracruz was where the maids from Kobbe lived and plied their night trade with the "raps" (for non-Zonian readers - a derogatory for those of the GI soldier persuasion derived I am told to demean GIs when the US uniform still included leg wrappings WWI?) . If you walked out the "gate" past the little town of Veracruz you came to a tiny fishing village. About a dozen family bohios - live, cook, entertain downstairs, sleep etc upstairs close under the thatch roof with the stair log pulled up. That was where my friend and mentor Dario, the manager of the Kobbe horse stables lived... He was the head man/mayor/patron/elder of the village. He called himself a Darien Indian and had very light skin and green eyes. I thought this was due to the proximity to the base but found many of the same complexion and coloration in the interior later in life. These had had little or no contact with white folk in modern memory. Dario was on the Elder council in many villages. Dario took me into the jungle there a taught me how to hunt. I had originally met him in the interior near El Baru where he was visiting another village in which he was an elder. That is another story. He took me on a trail that was only navigable on foot or with bush ponies overland to Arraijan, about a 2 hour walk and along the coast up to the beach near Chorrera that took most of the day on foot. On a pony you could make it in 3 hours to Chorrera Falls. When I got my Lambretta motor scooter I used these trails to get there when the Guardia, CZP, or MPs were interested in talking to me for some prank or other. Chinese, Chinese, Chinese - come on Clarke. You promised Chinese -- they want Chinese. On the jaunts through the jungle we followed different paths depending on what we were hunting, trapping, fishing for, or who we were visiting. On one of the trails there was an old stone foundation and 20 or so orange trees overgrown by vines. The vines had pretty much stifled the orange production but a few were available and ripened. Dario told me that the place was not a good place - translation don't go there if I know what is good for me... But I'm me, after all... Next time I was through there I hopped off the trail and snagged a few of the oranges. They were just a bit larger than Ginnups (yeah, yeah - spell it however pleases you) and had a very thin skin you couldn't peel off. I cut one up and as any good student of native medicine I tasted a drop of the sweet juice - wait, wait - no ill effect in 1 hour -- drink a bit more juice and so on until I was quite sure it was not poison unless it was very slow acting. Turned out to be just an orange but one that should only be found in China... Mandarin oranges. I wanted to save the trees and enlisted "Dario-n-the-villagees". First I had to track down and hopefully debunk the "not good place" that hung on the area. The tracking of the basis for the caca-rep is too long to recount here but the result from verbal history in the Darien was as follows. First, when ever anyone nosed around the place they disappeared - blamed on brujeria from rumors started no doubt by Chinese sympathizers/lackys and strengthened by Bamboo wind chimes the Chinese hung in the trees to scare birds and animals out of their crops. Proved when we cleared the vines I ultimately found a bamboo stave with oriental figures carved in it grown over in the bark of one tree. The second caca-item was that a Darien Bruja explained the ultimate disappearance of the Chinese as and attack by Duende who drove the remaining foreigners out with a sickness. My guess is malaria or yellow fever. All this came from oral traditions I coaxed and pieced together for over a year bit by bit from some Abuelitas and viejos near the place. I added my piece by bringing my ugly old maid from the Colon side to visit the place. The other West Indian maids said she was an Obeah princess from Barbados (that's as good as a Bruja, right) and made herbs and teas to take off jujus� I brought her to the place and had her talk to me in gibberish (prearranged of course) in front of Dario and a few of his buddies. I translated the gibberish to say she knew the Duende curse and that it would only hurt Chinese, but that they were NOT to dig in the soil here. (I added this in case there was some infectious agent) They could clean up the vines on the trees - in fact the Duende would probably be glad since the love oranges. Darien could eat the oranges but never, never, never take all off the tree. Leave one or two for the Duende. I suspect that to this day those 20 trees are bearing their sweet Mandarin oranges and are well tended by Darien. But I bet no one has ever taken the last orange off a tree. As a point of interest, Veracruz is only about 3 miles less than 5 as I recall... Hunting we walked 20 miles in a day through jungle trails... 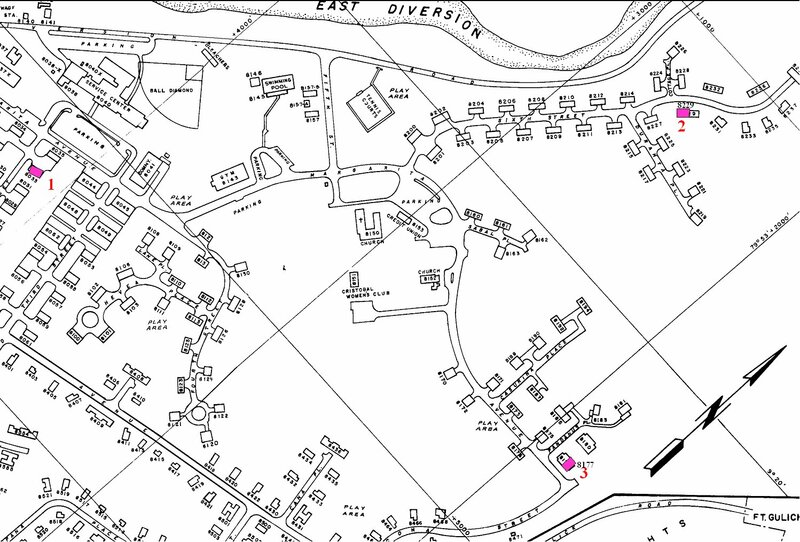 I have walked home from the Kobbe pool allot -- walked from Cocoli to Rossou to Rodman on occasion... Frank Todd and the Fortunes lived in Big Tree housing. My sister had a pony named Bambi at the stables -- she fell on his rear hoof as he was running away from her and broke several bones in her face and killed 1 tooth... It was rainy season and the 4pm cloudburst came flooding the field as she lay unconscious.. The pony nearly tore off her shirt and finally bruised up her arm and shoulder dragging her to dry ground and then stood over her (witnessed by staff)... How's that for good jujus... Our Obeah maid walked to work at Rodman from the Ferry before she went back over to the "otherside" to live... Walking was a no brainer in dem days. My mom dropped me off at the chain at the end of the mine dock. She had picked me up from school at 3 PM. I unloaded my junk from the trunk of the car and promised to be careful and to be ready when she came to pick me up at 2 AM. First things first I thought as she backed back the car out to the causeway and left. I walked out to the end of the pier with three pole holders. One pole holder centered between pilings marked the territory as mine for the night. I never took the end hole since there is a huge grouper that destroys equipment. The grouper once took a 6 pound corbina I was trying to land, like so much bait. At 300 lbs. he just swam off. How do I know he was 300 lbs.? At another time several of us set out and caught him, but that's another story. Next I hung 9 foot long Calcutta cane poles in the holders, clipped on the 6 oz weights to the end of the 40-lb. test mono-filament line. To the weight I clipped the 80-lb. test mono-filament leader and triple hook which I hooked over the reel bar. Ready for bait. The poles cost $3.00 at the commissary. We taped eyes and the pen reel on with black electrician's tape. This makes it easy to change the position if a large fish and long fight change the bow in the cane. Taking more than two spots is poor taste. I had taken three but one is for Mr. Englekie. He couldn't get out until after dark so I always saved one for him. Next I hung the lights. In the center beneath each pole holder a green enameled 20 inch light shield is hung by a piece of parachute cord to which the electric cord is taped. Each shield had a large 500-watt photoflood bulb in it. I had loops knotted in the cord every foot which is then hooked over 16 penny nail driven into the timber between the pilings to adjust the height. The tide rises and falls 16 feet every 6 hours here so the lights must be carefully watched during fishing. Hot photofloods hit the water and pow; it's replacement time. Last, a floating bait box is secured in one spot and a 3 foot square drop down landing basket is secured to one of the pilings. Now I began fishing for bait. Jigging with spinning gear for moonfish and sticklebacks is the first thing to try. A jigging rig is made by tying a half oz bell weight to the end of 6 pound test mono. Six to eight small triple hooks are tied every 6 inches up the line from the weight. The line is then cast out, allowed to sink to the bottom, and then retrieved really fast whipping the pole hard after reeling the slack out of the line. Each cast the procedure allows about 20 whip-reel slack cycles. I don't know how it worked but usually 5 or 6 palm sized bait could be snagged in less than an hour. These are held in the bait well until after dark. At about 6 PM others started showing up and grumbling about my taking up the best spots. Hey come out earlier than me was always my answer. At dark Mr. Englekie took his post returning my light holder and pole. The lights were turned on and baited hooks were dropped. Sometimes he would bring live shrimp bought from the Laboca side ferry ramp. These almost guaranteed a couple of small 3 to 4 pound corbina if nothing else worked. We used the moonfish hooked through the back just below their top fin and lowered down just below the reach of the light; about 12 feet. When the big corbina chased the moonfish they would pull the line and the 6 oz weight all over. When the big fish caught the bait the clicker would start and the line would start to run out. I would get the pole out of the holder, let him go until he stopped to swallow the bait and then reel in the slack and strike to set the hook. Then everyone reeled in their poles to let you fight the fish and someone manned the basket to lift the big fish up to the dock when you had fought it to the top. You guided it into the basket and they lifted it up to the dock. It was wise to fight it until it was worn out or it jumped out of the basket snapping your line. Once it was on the dock, the lines when back in. I started fishing with my dad in my freshman year. I guess I caught 400 fish during my high school years (through 1960). The largest corbina I ever caught was a 32 pound yellow corbina. Five to twelve pounders were usual. The largest snook I caught was 19 pounds. I caught 2 big red snappers in 4 years. I sold most of them to the Chinaman at the YMCA for 30 cents per pound. I still fish up here in the Chesapeake and catch some fine fish. In 1964, I took pictures of the Flag riots. I was at the High School and when the fighting broke out I followed the action. The next day, when the Army was in the "Show of force" stages no one from the press was allowed into the area. From the Public Information Office in Quarry heights, I was able to get a pass as a representative of Life Magazine. This got me into the Tivoli Guest House. While there, I reported to Huntly-Brinkly from the switch board; they could hear the shots. I almost got caught. I was on the top floor with the US Rifle Team, who had fortuitously been returning from a Central American match and were pressed into service. We took fire for several hours with standing orders not to fire back. The officer in charge was hit by a 222 round and had his shoulder joint vaporized. He told me to take his helmet and flak-jacket when he was moved to the rear. The sergeant told command on the radio of the wounding and asked if suppressing fire could be allowed. After a long delay one volley was approved, but only after we had taken a round which actually hit out post. Panamanians were sniping at us from everywhere mostly with small caliber which did not go through the floor boards or carbines which were stopped by the sandbag cover on the floor. The one that hit the officer was in the elevator well on top of the PanAm building. The team prepared with one targeted sniper to each man; 10 or 12 of them. When the sniper on top of the PanAm cut loose and sent a round through the walls, she was answered with a clip full from from a high-powered target rifle. She staggered out on the roof, still strapped into the rifle, and got one more through the chest. Almost before she hit the ground, a Guardia appeared on the roof to get the rifle. Apparently he knew exactly where she was (go figure). Every other team member also got a sniper in the barrage. The radio snapped alive with a crisp order to cease fire but the volley had the desired effect. Later it was rumored they found 3 dead Cuban snipers with 222 rifles and 20x scopes. The others were Panamanians out for a day of target practice at troops they thought were unarmed and with orders not to fire. There was no more sniping for the rest of the day. The roll of film I took of that was confiscated from my camera as I left the scene. I went back later and retrieved the rolls I had hidden. I sold them to Life Magazine but the PIO apparently convinced them not to use any; especially the ones of injured American soldiers. One of my pictures was used in Cosmopolitan to illustrate an article. When I first went down to the Tivoli the Major in charge (Woodside sticks in my mind but I'm not positive) told me he "wanted no damn Zonie kids in his sector, get out". I showed him my press credentials for the Panama American newspaper for whom I regularly provided pictures of BHS football games. He laughed in my face. I was courteously informed that he would assign transportation to the Public Information Office (PIO) in Quarry Heights and if they gave me a letter I could go wherever they approved me to go. He wrote a sealed note, gave it to the driver, and we went to PIO. I was later to find the contents in effect said don't let a Panamanian correspondent in. You guessed it; the Captain at PIO denied my request for access. Dejected, I walked over to the Officers Club to get lunch. At the bar there was a photographer knocking back double gin and tonics. He turned out to be the photographer for Life Magazine and was in the market for all the film he could get. He would pay $100 per roll of 35mm undeveloped. Commiserating with him on the denial by PIO he told me Life had full access but he wasn't going down where he could get shot! We continued and two gins later I told him that I had pictures from the confrontation at the BHS flagpole and he began to drool. I was offered a $200 check for one roll. I parlayed that into $250 cash on the barrel-head, his vest with Life Magazine logo on it, and his card, with a signed note from him on the back assigning me as a Life Magazine Photo Journalist for the duration of the conflict; and all that for two rolls. I got the number of the phone at the bar and with card in hand was off again to PIO. I sensed the Captain was a lost cause so I asked to see the Lt. Colonel (probably LTC Lou Churchville). The Lt. Colonel heard my story, called the bar to confirm, and gave me a signed letter allowing me run of the theater even during hostile action; a standard form. I had to sign a form holding the Government harmless. Later in the day, after the Major in charge of the rifle team had been wounded and I had been decked out in his flak-jacket and helmet, actually just before the fusillade that suppressed fire for several hours I went to the back of the building to use the plumbing. I noticed two officers and an MP walking up the hall from back to front toward an observation scope placed in the front to draw sniper fire away from the post. One officer was in fatigues and the other was in dress khakis. I couldn't believe it, when the one in khakis walked up to the decoy scope and putting his eye to it, tried to adjust the eyepiece. I ran down the hall and tackled him, dragging him away from the danger. While the other officer, a Major Genaral Bogart (CG USARSO), of the sector operation was abrading me for man handling "General O'meara" <gulp>(USSOUTHCOM CINC ), a carbine round holed the observation-scope making my action heroic rather than punishable. ; the lieutenant pointed to the new signatures. The major sighed a big sigh. I never saw the major again. One last anecdote. When I had completed the switchboard patching I figured I would take a bio break; all the enamel fixtures on the top floor were history as were the water pipes. I found a little bathroom so small I had to back in, drop trou, and sit. Now as some of you know CS gas is heavier than air and had been in heavy use. It had settled down the vent pipes and was highly concentrated in the little room I innocently reversed into. I just wish coach Anderson could have timed the 40 yard speed I made getting out of there. It was two weeks before I could walk right. 1. In the Zone one of the sports we never had was Javelin. I heard that once in Balboa Stadium they threw the Javelin toward the stadium seats so the crowd could see the marks. They left plenty of clearance -- or so they thought -- but a true champion lofted one into the stands and impaled a spectator. Can anyone confirm? 2. One gruesome one I saw was the death of Officer George Nadeau of the CZ motorcycle cops. I was riding the bus from Fort Kobbe to Balboa and we were coming by the entrance of Corozal (sp) or Cardenas where there was a Chinese garden. He was knocked down in traffic, his head with no helmet hit the pavement, popped open and discharged its content. I hurled a lot! I have never forgotten that and still dream of it from time to time. I have never ridden a bike without a helmet, regardless of the law. Marlboros, OK? :-)) Someone had an MG convertible and took some of my load away from me and then lost it on top of El Baru. I think it was Walter who told me he was thrown out of the MG and was skidding down the road on his back at 60 mph. Whoever it was said, "I could see where I was going and I could steer but I just couldn't stop." A cycle had been involved and the passenger, a girl, had gotten stabbed in the thigh by the break handle. She has a 1 inch long piece of muscle, just a bit thicker than a piece of spaghetti, jerked out by the handle. She could make it wiggle and everyone was laughing at it. We took everyone to the army medics who were at Santa Clara for Banyan Tree maneuvers. The medic looked at her (a lot; Raps) looked at the wiggling muscle, snipped it off with a pair of scissors, put a Band-Aid on it, and let her go to the party. 4. I ate "carne en palito" at the Rancho which I washed down with a couple of liters of Balboa. One day when I went down at 7 PM on a Friday to get a keg for a Contractors Hill party, I saw the "..palito" man skinning what looked suspiciously like a collie. Questioned, he assured me I had eaten his dogie on a stick for 3 years and reminded me I had complemented him on the wonderful taste every time. He ventured a bet that the next time I got a couple of liters in me, and smelled his wares, I'd be chewing it again; all the while he was denuding the Lassie of fur. What? You think I took the bet. No way!